I've been going through something of a reading funk these past few months and the fact that I read through this book in under 24 hours is a bit of a miracle. If a book doesn't grab my attention right away, I find myself setting it aside. These days I'm short on reading time so I have to make the best of it! 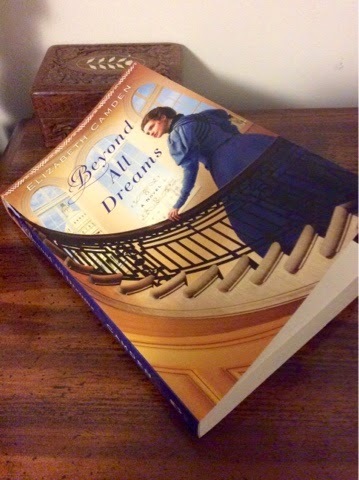 Beyond All Dreams captured my fancy last year when I was making my book wishlist and surprisingly this one really lived up to my high expectations. With chemistry fairly popping off of the pages, I was hooked. A few times I hit stumbling blocks with the hero, Luke (he seemed a bit too aggressive and he really jumped the gun when it came to confronting Anna with his feelings), but overall the story was interesting and unique. I LOVED the fact that it was set in 1898 and mentioned the Spanish- American War even though it was highly fictionalized. When's the last time you read a historical romance with a congressman as a hero and relations with Spain in question? Exactly. Probably rarely or never. Beyond All Dreams is a romance that I think will appeal to a lot of readers. Even though it's Christian fiction, I didn't find it preachy in the least. I haven't read most of this authors previous novels, but I'm really considering catching up on those titles since this story was good! Read what others are saying about the book HERE. Thank you for reading my review. I'm definitely going to give a few of her other books a try!